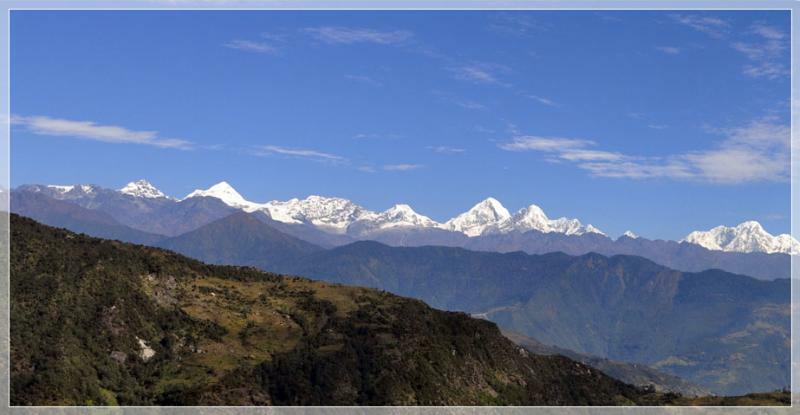 Kumar Lama was born in 1958, into a family of farmers and sheepherders, in the ancient Buddhist community of Yolmo, which is located in Northern Nepal on its border with Tibet. There were no artists or painters in his family, and yet at 9 years of age Kumar Lama was discovered to be a prodigy by Palden Lama, a most highly respected and revered master Thangka painter (who painted 108 temples and monasteries during his lifetime.) Almost immediately, Kumar Lama began his study and apprenticeship with Palden Lama, which included a complete traditional curriculum of foundational training in the making and preparation of tools, materials and paints, as well as in the study of proportion. 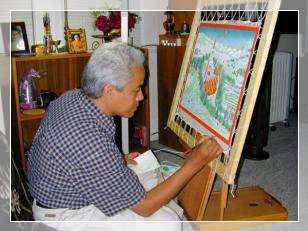 Kumar Lama rapidly advanced in his studies and in the development of his abilities, such that within a few years he was able to produce complete Thangka on his own. He studied and became fluent in the two major “styles” or “schools” of Thangka painting, Mendi and Karma Gadri. At age 15, after the death of his beloved first teacher and benefactor, Kumar Lama walked 5 days through the mountains and jungles of Nepal to Kathmandu City to study and work with his second teacher, the young, but already accomplished master Thangka painter and artist, Jigme Lama. Under Jigme Lama’s guidance, Kumar Lama further elevated and refined his technical craft and his art and also began working commercially, exhibiting his work at the Nepal Branch of the October Gallery (solo 1990), Nepal Art Association Exhibit at the Tradition Art Gallery(group 1992), Siddhartha Art Gallery(group 1994) in Kathmandu, Nepal and in the Davos Switzerland Art Center(solo 1991), Davos, Switzerland and at the Yoga Institute (solo 1993) in Munich, Germany. From 1982-1996, he painted wall murals in three Buddhist monasteries in Yolmo and Kathmandu, Nepal and owned and operated a 4-7 student studio in Kathmandu for the training and development of other young thangka painters. Also, during this period (1985- 1999) he began restoration work on Thangkas and statues at monasteries in Kathmandu, Nepal, France, Hawaii and in Watsonville, California at the Vajrayana Foundation using natural pigments, acrylics and gouache paints. In 1988, Kumar Lama and his art were discovered by the revered Tibetan Buddhist teacher and scholar Namkhai Norbu Rinpoche, who invited him to significantly expand his painting and exhibiting activities in Europe. During the next seven years, Kumar Lama was both commissioned to paint and exhibited his art in Italy, Switzerland, Germany, Austria, and France. In 1991, the Ethnographic Museum of the University of Zurich in Zurich,Switzerland commissioned him to paint the Kalachakra mandala. This painting, using only natural pigment, is still on exhibit and is 32 " by 34 " unframed and took one year to paint. 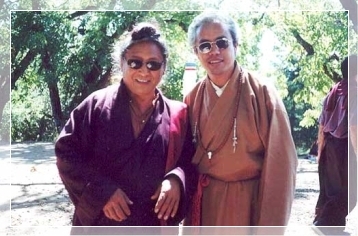 In 1994, Kumar lama, while exhibiting his art in Switzerland, met Lama Tharchin Rinpoche, founder of the Vajrayana Foundation in Watsonville, California. Lama Tharchin had been looking for an artist to paint the Dudjom Tersar Lineage Tree for his temple, but had not been able to find one who had the technical skill for this project. When he saw the exhibition of Kumar Lama's work, Lama Tharchin knew that he had finally found the right thangka painter for the job. As a result of this meeting, in 1996, Lama Tharchin Rinpoche invited Kumar Lama to settle in the United States, to paint and teach under the auspices of the Vajrayana Foundation and commissioned him to paint the Dudjom Tersar Lineage Tree. This project ,unframed at 5 ½ feet by 8 feet, took two years to complete. The work is very precise, detailed and meticulously executed. Many of the fine lines on this painting are made with brushes of only a few bristles. The skill that it takes to paint these lines without a trace of a wiggle is the result of 30 years of daily practice. Currently, Kumar Lama is a master thangka painter in residence at Pema Osel Ling, the Vajrayana Foundation Buddhist retreat center in the Santa Cruz mountains. For the past 5 years he has been painting by commission, teaching, and exhibiting his work throughout the San Francisco Bay Area . His most recent solo exhibits have been at Pro Arts Gallery (August 2000) in Oakland, the California Institute for Integral Studies (Summer 2000) in San Francisco, the Sanchez Art Center (September 2001 thru March 2002) in Pacifica , City Picture Frame Gallery in San Francisco (August/Sept 2003), California Institute for Integral Studies Juried Exhibit(group/Sept 2003)in San Francisco, where he has exhibited thangkas and his newer non traditional secular work. He has been teaching private Tibetan painting workshops 4-6 times a year since 2000 all over the San Francisco Bay Area by invitation and recently ( August 2002, and August 2003) taught a one week Tibetan Dragon Painting workshop at the Mendocino Art Center in Mendocino California. Kumar Lama also regularly gives slide presentation talks on the "history of Thangka painting" that are well received and very popular. Kumar Lama's most recent work deserves a special note. Historically, for cultural and religious reasons, Thangka painters only paint sacred art. When Kumar Lama came to the United States, in spite of these prohibitions, he was inspired to expand his work by blending eastern and western concepts, and as a result for the last 4 years he has been painting a series of expressive secular non traditional scenes from his childhood depicting Tibetan life and culture. This synergistic blend of east and west, internal spiritual and external western material, is creating a challenging and exciting new phase in his work and in his life as an artist. Kumar Lama is a very dedicated teacher, artist and a serious lifelong Buddhist practitioner, who is kind and gentle, brave and adventuresome. He has been a working artist his entire adult life and his work is his life. Fluent in English, Tibetan, Nepali, Yolmo dialect, and Hindi, Kumar Lama is an engaging, humble, self educated man from one of the most isolated and remote areas of the world. He was born into poverty and caste tradition, and yet through the strength of his art and the determination of his spirit, Kumar Lama overwhelmed the odds and came to the United States to develop his work and carry on his skills and training. He plans to make California his permanent home and is applying for his citizenship. In the future, he intends to establish a school of Tibetan painting in the Santa Cruz area .By bringing this ancient knowledge to the West, Kumar lama hopes to continue to preserve and honor the traditions and technical purity of thangka painting by developing a first generation of American thangka painters.